I slipped the leash around his neck for the last time. He wagged his tail, hopeful even through his labored breaths that we might be going for a walk. 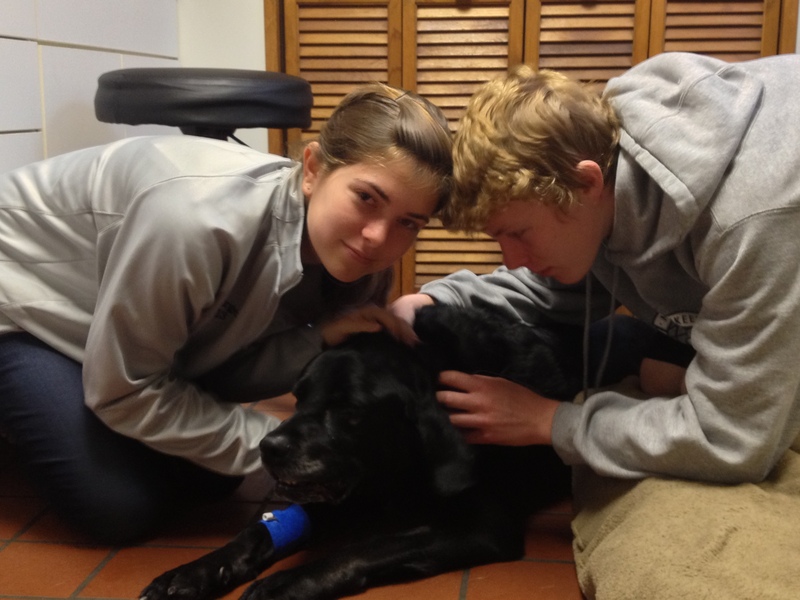 Just 24 hours earlier, Max, our 12-year-old Lab, had been diagnosed with cancer, which had aggressively metastasized. The vet showed me the x-rays, his lungs mottled with white. I started to weep. The big old boy had lost 13 pounds, down to 74. He had a wheeze and a little cough. I was thinking maybe pneumonia. I wanted us to have the holiday weekend with him; Mr. 70 Percent was due back from Vermont on Sunday, and he needed to see Max one more time. But I couldn’t stand listening to him gasp for breath. He could barely lift his head, let alone get up and greet anyone who came to the door. He had to be suffering. My husband, a cat person until we got a dog, understood. I held the phone receiver up to Max’s ear so he could say goodbye. Max first came to us via Newark, NJ, where he had been abandoned in a shopping cart. He was about a year old, the vet estimated, and one of his paws bore a big gash closed with stitches that had been left in too long. (We speculated that his owners had ditched him because the veterinary bills got too high.) My friend Archie, northern New Jersey’s patron saint of rescued dogs, called; she knew we had a soft spot for Labs. I was working full-time in New York and 7 months pregnant with our third child–so a dog made perfect sense. But Max was handsome and sweet, housebroken, crate-trained, affectionate and well-mannered. He knew basic commands and never tried to jump on the furniture. It was love at first sight. Our son, then 4, would climb into the crate and lie by his side. 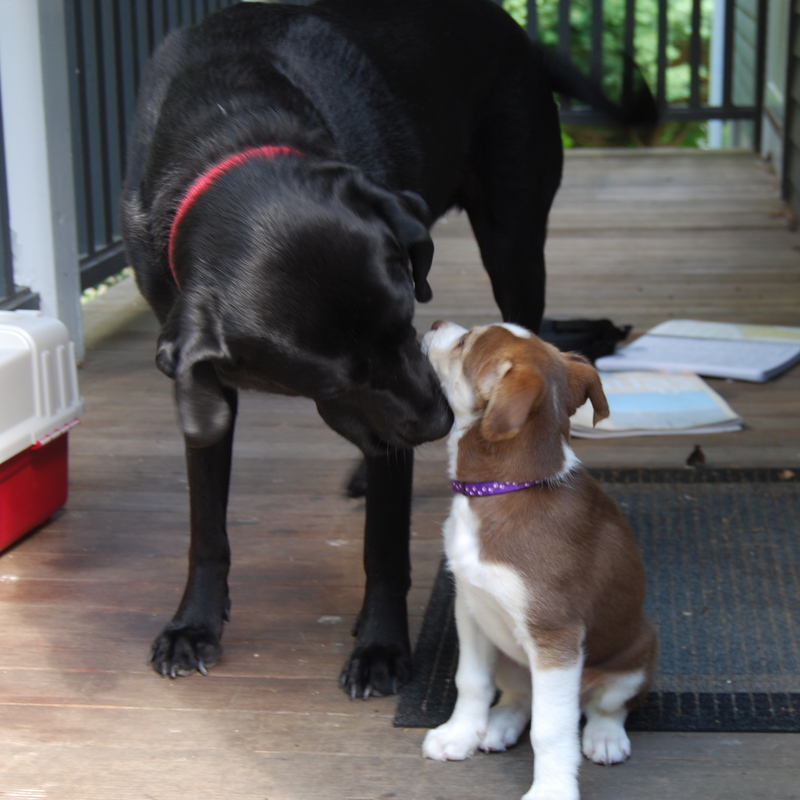 When we brought home the new baby, and then 6 years later the new puppy, Max wouldn’t stop wagging his tail. Max had his shortcomings. He seemed to harbor a personal vendetta against anyone in a uniform bearing packages. His bark was deep and scary and he did not always make visitors feel welcome (though as soon as they crossed the threshhold, they became a part of the pack he would guard with his life.) He didn’t like to be alone, which created some awkward moments. When he was young, anytime Mr. 70 Percent and I started to get romantic, he would come bounding over to the bed, ready to play. If I had all three kids in the tub in our tiny bathroom in New Jersey, he had to squeeze in, too. His gale-force tail could not only topple toddlers but also clear a coffee table of glasses, newspapers, and puzzle pieces. Among the things he has eaten off the kitchen counter: a roasted chicken, half a pizza, a dozen pumpkin muffins, a pound of toffee and a full bag of Nestle’s semi-sweet chocolate chips. Contrary to what I’d heard, Max tolerated the chocolate just fine. The cancer proved a more intransigent foe. 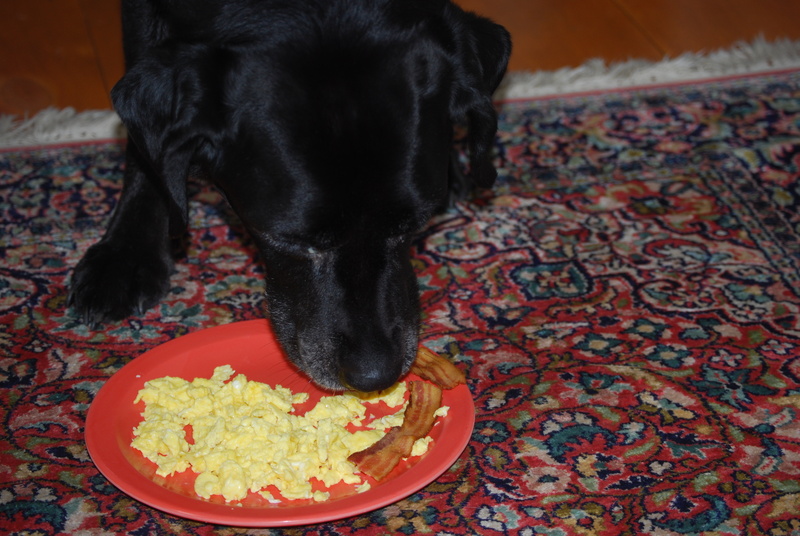 On that last day, I made him a plate of scrambled eggs and bacon, which he ate half-heartedly. Then my two older children, pale and somber, accompanied me to the vet. 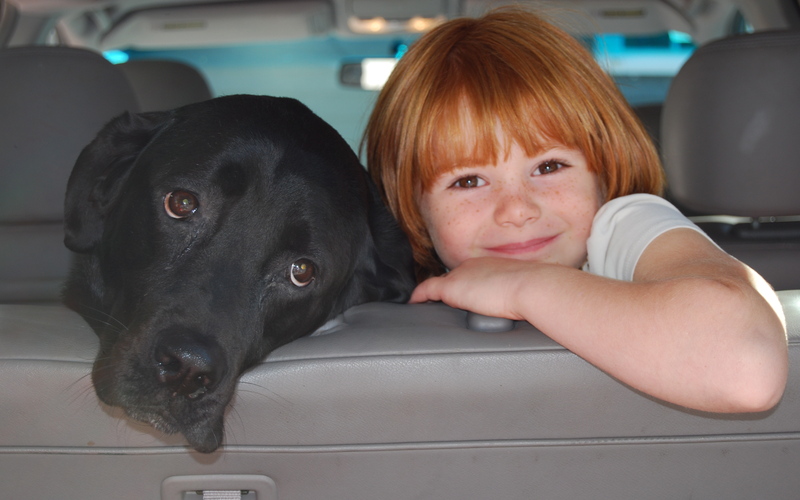 Their 10-year-old sister, who had never known life without Max, couldn’t bear to go. “Do you want to pay now or later?” the nurse asked gently. I handed her my credit card, trying hard not to think about this grim ordeal as a business transaction. I had already nixed burial in the pet cemetery (prices starting as low as $850, plus an additional $350 for the top-of-the-line “high-impact styrene plastic” casket!). And I had no desire to keep Max’s ashes in an urn on my mantle–even if I could afford the $205 “solid wrought bronze urn with decorative filigree,” complete with engraved name and picture frame. The vet gave Max a muscle relaxant, which made him plop down sleepily on the floor. He was breathing easier. As she administered the lethal injection, we gathered around him, whispering through our tears what a good boy he’d always been. In moments, he was gone; it was shockingly quick and blessedly peaceful. The nurse took a final imprint of his massive paw, which I later noticed came with instructions on how to bake and paint it–kind of like Plaster Funtime. Max was the only being in my life who never felt conflicted about me. He never found me annoying, disappointing, or embarrassing; he never once rolled his eyes at me, stormed out of the room, or told me to “Stop talking.” He didn’t complain about what I fed him, asked of him, or watched on TV; he liked my music just fine. So today I feel a little less loved than I did last week. No one will saunter over to my desk and put his head in my lap, just to check in. No one will follow me expectantly around the house, paying close attention to what shoes I put on. When I come home from the store, the only family member who will greet me with gusto is Max’s sister, Riley, who is wandering around in a bit of a funk. She knows there’ll never be another Max. But if she’s lucky, there will be a new puppy in our future who can again make our family complete. This entry was posted in Family life, Parenting, Pets and tagged animal shelter, discussing death with kids, dog rescue, euthanasia, Pets, veterinarian. Bookmark the permalink. A lovely story about such a sad day. So sorry for your loss. So sorry to hear about Max, Sue. I cried as I read your post. It was a wonderful tribute to him and to your family. I’m so sorry you lost Max but I’m so glad he was in your life so you all could unconditionally love each other. Condolences to you and your family. You’ll make a lovely home for a new little puppy. So sorry for your loss Sue – but so happy you all had each other for so long. I lost one after 13 years a short while ago, with similar sentiments. Dogs are amazing creatures. Your article is a great tribute to Max and your loving family. 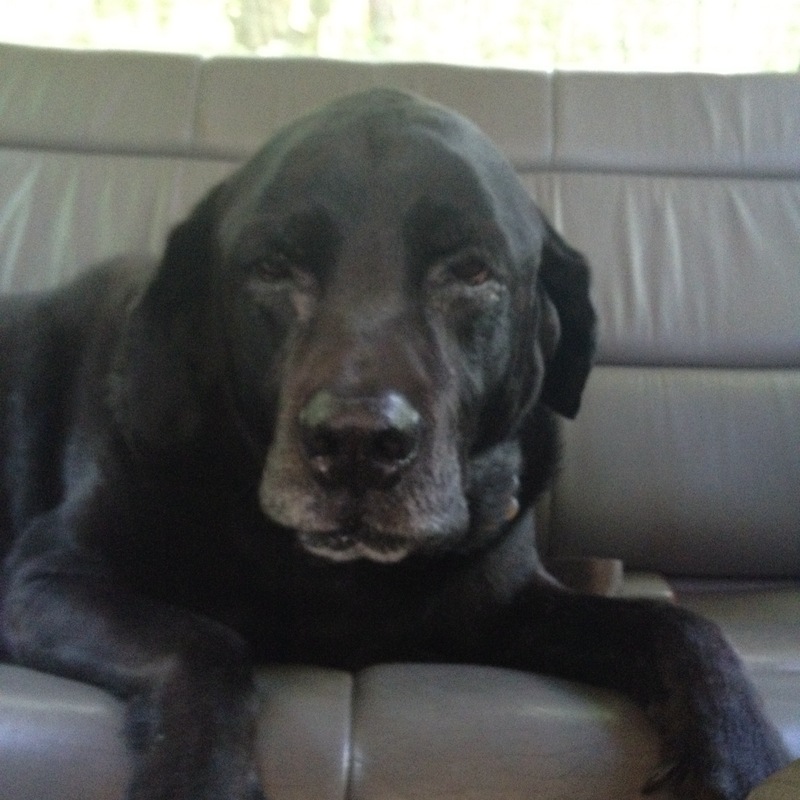 Sitting here crying, remembering my lab Hershey who passed away 2 summers ago from diabetes complications. So sorry for your loss, and my hearts with you right now. Thank you for this tribute to Max. Our hearts are aching too. What a privilege to have known Max. There never was a sweeter dog. Sue, you’ve written a beautifully, touching piece about my favorite animal. I know that feeling of emptiness when that fateful day arrives. That whole wonderful world comes to an end and you are left with nothing buy sweet memories of the joys you and Max one shared. I too, lost my Lab, Kizzy, years ago, but she is still with us in a memior she wrote last year titled, “Kizzy, Whose Memior is This, Anyway?” I’m sure that Max, too, has a story to tell. All my best wishes and my sympathies are with you. I don’t even know what to say. I’m crying with you in the middle of my office in a sea of people. That was a wonderful love story. I’m so very sad to hear this news, Sue. You were lucky to have Max, and he was indeed lucky to have all of you! He could not possibly have found a more loving home. There’s nothing like dog love. Sue, thanks so much for putting it in words. Thinking of you guys! So sorry , Sue. What a lovely tribute. This is my first time reading your blog and I’m in tears. I still tear-up when I think about having to put down our lab/beagle mix. He was 16 and it was cancer. That day was over 10 years ago but I still refer to him as “my dog” and will miss him always. I forward to reading more about you and your family. An ex-NYC woman myself, living in VT (17 years and hard to believe!) I completely related to your blog from yesterday, The Trouble with Vermont… (1/22/14) it hit the nail on the head for me and I was saying it to myself and some few others who’d listen since the day after I moved here….